The custom building game is an endeavor fraught with potential minefields. Sure, the sites are often majestic, the budgets are usually stout, and the products and materials are likely to be luxurious. But the clients can be demanding, the work has to be of the highest quality, and builders must collaborate with architects to make sure details are flawlessly executed or risk having to redo them. Custom builders are expected to be up to date on all new advancements in construction, including the latest in products and materials, construction technology, green building, high-performance home construction, and building science. They are expected to use best practices for everything they do, no matter how much it costs. Their houses must also have the best-looking kitchens and baths with the best cabinets, tile, flooring, lighting, appliances, and everything else. The residential construction industry as a whole looks to the custom market for design ideas, for early adoption of new introductions, such as large lift/slide doors, linear drains, triple- and quad-glazed windows, waterproofed wet rooms, high-tech mechanical ventilation systems, and much more. It’s the reason why high-end trends trickle down to the entry- and mid-level builders. Manufacturers and production builders and remodelers observe what tracks with the luxury market, work out the kinks, and then find a way to deliver it to buyers and clients of lesser means. This month we cover two challenging areas that custom builders are expected to master. One is sustainability and green building. It’s a tough nut to crack for the entire industry, and not all custom builders have mastered the practice. Our guest columnist, builder Don Ferrier, helps alleviate some of the frustration by revealing the five biggest missteps practitioners make and listing some ways they can get off on the right foot. Another area that they must master is designing kitchens and baths that offer plenty of wow factor. This is tough for everyone, but especially for custom builders trying to balance clients’ big dreams with their actual budgets. 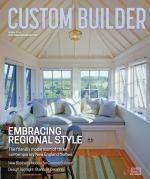 Senior editor Susan Bady interviewed builders and architects for helpful advice on how to make the process easier so that it pencils out. Having to shoulder these responsibilities elevates the importance of the custom builder and the custom market at large, but, as always, with great expectations comes great responsibility.